Farm Volunteer/Tour days for September will be on the third Saturday of the month: September 16th. Farm Volunteer/Tour days for July and August will be on the third Saturday of the month: July 15 and August 19. Interested in learning a little bit about where and how your food comes from? Join us for our Monthly Volunteer Day, where you will help weed, harvest or plant with our farmers! It is the last Saturday of every month from 9:30-11. If you would like a tour of the farm, come a half hour early at 9 to go on a guided tour with Assistant Farm Manager, Stephen Dienger. Come see what is inspiring us every day! Email Erin at erin@ourharvest.coop and let her know you will attend. If no RSVPs, event may be cancelled. Hope to see you there! Take a guided tour of Our Harvest Cooperative's fields at Bahr Farm with our Assistant Farm Manager, Stephen Dienger, before our monthly Volunteer Day! Email Erin at erin@ourharvest.coop and let her know you will attend. Hope to see you there! 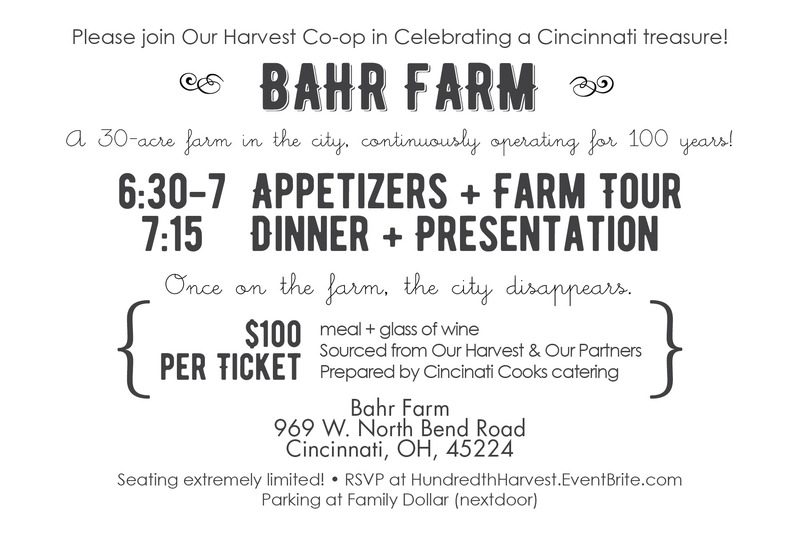 Please join Our Harvest Co-op in celebrating a Cincinnati treasure: a 30-acre farm within the city limits that has been continuously operating for one hundred years! Once on the farm, the city disappears. This celebration supports Our Harvest's food access work. Our Harvest received a partial grant to construct hoop houses that will extend our growing season, and expand our food access work. We hope this dinner will raise the remaining funds necessary to finish this project. With your donation these hoop houses will enable us to distribute an additional 15,000 pounds of produce at food access sites. Listen to the dulcet tones of harpist Carmen Current while we share a glass of wine and a meal sourced from Our Harvest and our partners. The meal will be prepared by Cincinnati COOKS!, a free culinary job training program out of the Freestore Foodbank that prepares individuals of all backgrounds for success & produces food for after-school feeding programs for school-age children. Parking at the Family Dollar next door. Buy tickets or become a Sponsor at HundredthHarvest.eventbrite.com! As a note: If you become a sponsor and want to share some of your tickets with members of our community that have fewer financial means, we can easily help make that happen. Click for a Printable Invitation Here! Take a guided tour of Bahr Farm with our Assistant Farm Manager, Stephen Dienger, before our monthly Volunteer Day! Pack a picnic and join us for a day of fun from 11 AM to 1 PM. Meet your neighbors, take a tour, and have some farm fun in an ideal setting! We’ll provide salad greens, you bring the toppings! Don't forget the outdoor staples: blanket, sunscreen, bug spray, water and your camera. RSVP to Erin at erin@ourharvest.coop. Take a guided tour of Bahr Farm with our Assistant Farm Manager, Stephen Dienger before our monthly Volunteer Day!